Rarely seen outside of botanical gardens, Rhododendron sinogrande is an impressive architectural evergreen plant native to alpine woodlands across southwestern China and Myanmar. 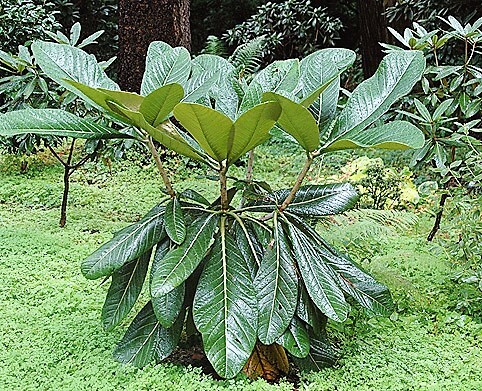 It is noted for its conspicuously large leaves which are in the fact the largest of all from the genus Rhododendron. Despite its exotic looks it has proven itself to be perfectly suitable for growing outside in the milder, southern climates of England, with impressive specimens on show in Dorset at both Abbotsbury subtropical gardens and Compton acres. Rhododendron sinogrande as an understory specimen which has evolved to grow in the low light levels of forest floors - which explains the gigantic leaves. They will perform best in full sun to dappled shade, but be aware that the leaves can be prone to scorch when subjected to direct sunlight. 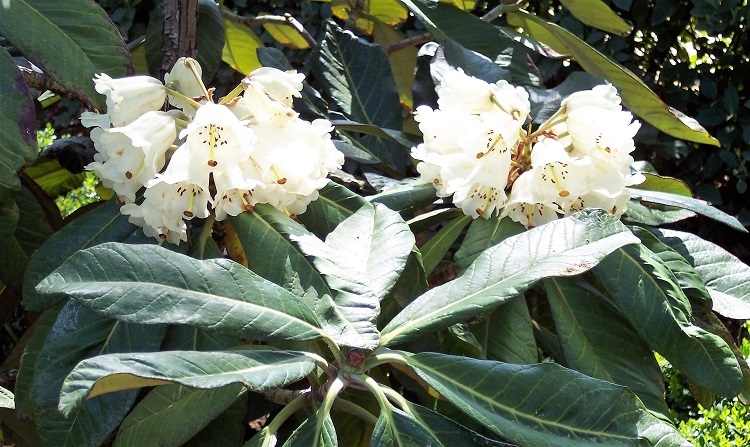 Unfortunately (as ornamental as it is) it is not suitable for suburban gardens as despite its under canopy requirements Rhododendron sinogrande can reach a height and spread of approximately 30 metres! It will not do well in exposed conditions, and like the majority of species from the genus Rhododendron it will require an acidic, moisture-retentive but well-drained soil. Also soils will benefit from digging in plenty of humus-rich, organic composts before planting. Avoid soils prone to waterlogging as this can increase the incidence of fungal root infections. The roots must never be allowed to dry out so additional watering may be required if periods of drought are experienced. Heavy clay or chalky soils can be improved by adding plenty ericaceous compost or moss peat. If well-rotted garden compost is available then that too can be added. Do not add fresh composts unless it has had a season to rot down naturally before planting. A fortnightly application of liquid soluble ericaceous fertiliser would also be of benefit under these conditions. Provide an annual spring dressing of composted bark, pine needles or other such acidic mulch to help retain moisture. Avoid having the mulch touching the trunk.